Push-Pull-Turn: Dump Truck Gets to Work!, Fire Truck to the Rescue!, and Up in the Air! ($15.99; Ages 4 and up) introduce young children to a construction site, emergency vehicles, and flying machines in each interactive, oversized book. 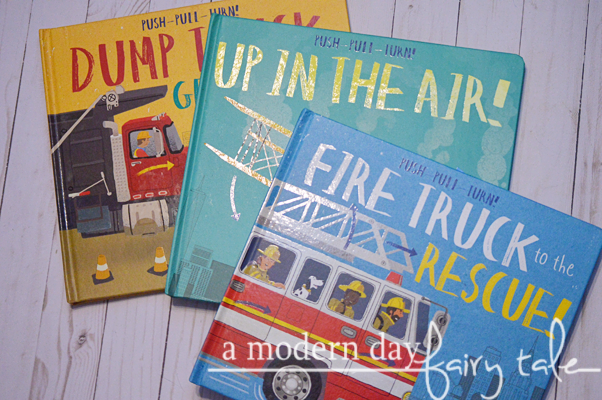 Each title features a lively story with flaps to open and tabs to pull to engage busy kids on the go! Lift the loader’s bucket, pull the fire truck’s ladder, and make the stunt plane do loop-de-loops, all while learning the basic parts and functions of each vehicle. Includes interactive flaps, wheels, and tabs. Join Squirrel as he climbs higher and higher up a tree in his quest for one big surprise in Up, Up, Up in the Tree ($9.99; Ages 3 and up)! With flaps to lift and peek-through holes, there’s lots to spot, count, and discover along the way in this beautifully illustrated and fun storybook. Includes flaps to lift and peek-through holes for extra fun and learning. Follow the trail for an exciting adventure with a rocket ship, a train, a boat, and more things that go in Trace Race: Things That Go ($9.99; Ages 3 and up)! 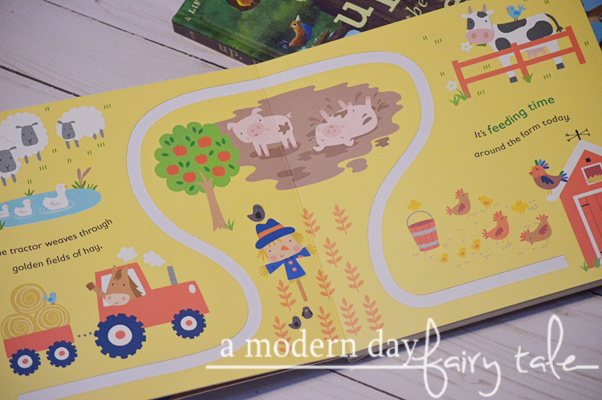 This storybook includes unique cutout paths for toddlers to follow with their fingers as they encounter vehicles in fun settings. With adorable illustrations and rhyming text, this on-the-go book is perfect for interactive story time. Includes a die-cut path for finger tracing! Now, these might be what most would look at and think 'boy', especially the transportation themed books, but I have to tell you, my daughter loved them! She loved having the opportunity to lift the flap, pull and more to bring the book to life. Up, Up, Up in the Tree also provided that same fun entertainment with a cute little character that kids are sure to love. Of all of the books, my daughter's favorite had to be Trace Race. This fun book allowed her to trace her finger on each page for a fun, kind of sensory experience even. Such a simple idea, but she loved it! What I love about this books as a mom is that while these are fun to read together too, they are also great for my daughter to experience on her own. At three years old, she is not able to read yet, but if I need to clean or get work done, she can entertain herself with these interactive features of each of these books! All of these books are available to purchase now at your favorite book retailers. See more great selections from Silver Dolphin Books and connect at the links below. And one very lucky reader is going to have the chance to win a copy of Up, Up, Up in the Tree and Trace Race. Enter using the Rafflecopter form below: a Rafflecopter giveaway Winner will be contacted via e-mail after giveaway ends, and will have 48 hours to respond before a new winner is chosen. 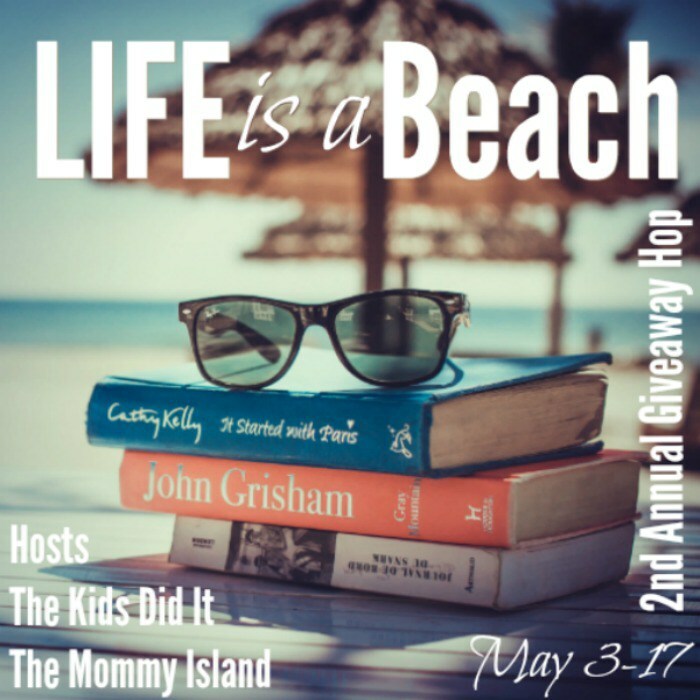 One entry per household, winning entry will be verified. Odds of winning depend on valid entries received. A Modern Day Fairy Tale is not responsible for prize delivery. These books are so cute. I think they would be great for our grandson. I'm pretty sure my squirrel obsessed daughter would love Up Up Up in the Tree!! Our daughter is three now, too and loves to "read" books on her own. 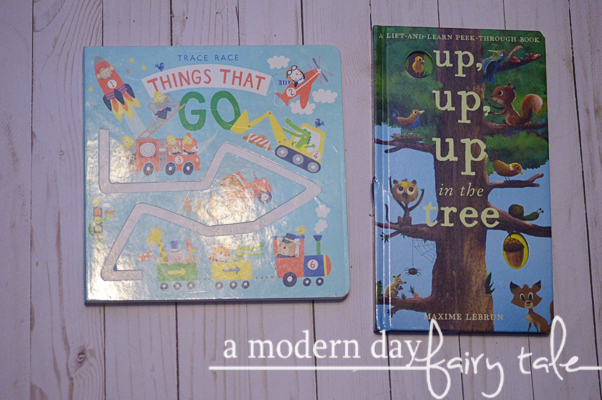 I love that these books are great for reading together or to encourage independent play. They look right up her alley, too! My little nephew would love these type of books and I would enjoy reading it to him too. These books are great! I bet my nieces would love the Up, Up, Up in the Tree one! My nephew would love to read both these books especially the Trace Race: Things That Go book. These look like great, cute books. My 3 year old grandson would love these books!